For those of you unaware – Magic Origins was released last Friday. While I’m not sure how you could simultaneously be unaware of that and still reading this, I’m sure there’s one of you out there. 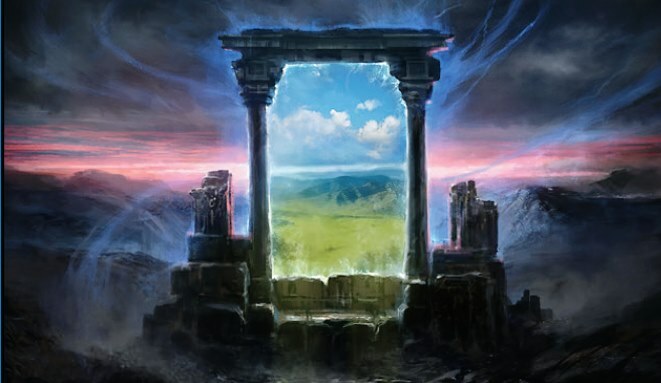 You’ll also be stunned at the news that an SCG Open was held in Chicago, giving this latest and final iteration of the Core Set a grand stage to display it’s powerful contributions to the Standard metagame and boy-howdy was it… lackluster. The first week after a new set is released, it’s often better to play a well tuned deck with very few new cards because it’s going to perform better than a brand new archetype in a vacuum. Coming into this event we all expected to see some sweet Elf on Goblin action… two enemy tribes that have been locked in an eternal struggle ever since they decided to start making Duel Decks. We were not disappointed. Ok, maybe we were very disappointed. 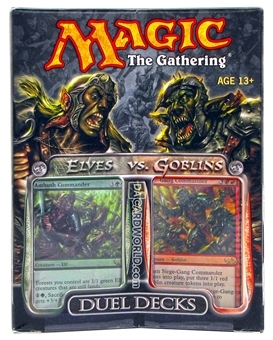 Goblins fared better of the two decks, posting an 18th, 24th, and a 39th place finish… hardly a second coming. Elves… well they did a lot worse, posting a single copy in the top 64 at 41st place. As many commentators of old would point out, a ham sandwich could get a 41st place finish in the right hands. Outside of these failed archetypes, what’s making a splash? 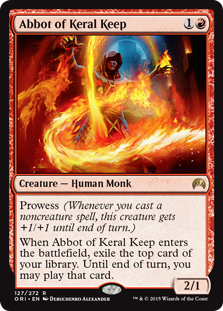 Abbot of Keral Keep only showed up in two mono-red decks, one with a 20th place finish and another in 49th. While this is hardly an impressive finish, it’s almost enough to overshadow all the attempts to run Ire Shaman thus far, a card that has been used to gauge Abbot’s power level. Woodland Bellower? Nope. Zero. While it’s not a resounding endorsement of playability, it will likely give us a little bit of a downward push. I’m still a fan of this card and look forward to picking them up on their way down with hopes of a big payoff on the horizon. The Archangel here did manage something that none of the cards discussed so far were capable of: cracked the top 16. 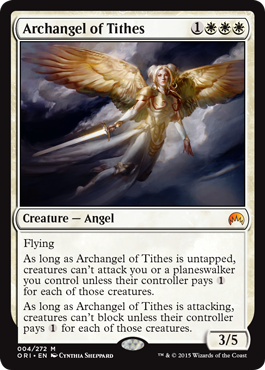 Showing up in the 14th place mono-white devotion deck, the Archangel joined a laundry list of value-adding creatures like Brimaz, King of Oreskos and Wingmate Roc to overwhelm opponents. This deck took great advantage of the absence of control decks, an archetype that would have normally tear it apart. With multicolored mana so easy to come by, this strategy just doesn’t seem worth the restriction… on the plus side, I’ll have a little more time to get rid of these Archangels I opened. 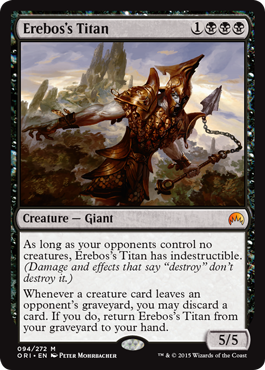 Erebos’s Titan – Conditionally powerful card with a prohibitive casting cost? Zero. None. I’m obviously still cold on this guy for reasons I’ve already discussed. Maybe there’s still a chance for this guy and his friend Gray Merchant of Asphodel to stake a claim on Standard, but they didn’t pull it off this weekend. Evolutionary Leap – My pet card, also a no-show in the top 64 decklists. 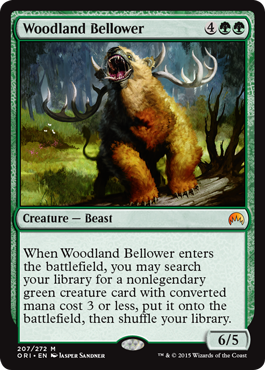 I’m not at all surprised this card wasn’t broken within the first week, it’s going to take a brewmaster to crack this one… I’m looking at you Sam Black and Conley Woods. Though, I admit I am more than willing to settle for a Travis Woo brew just to get the ball rolling. I’m still going to be trading for every copy of this leper that I can get my hands on, it’s only a matter of time. 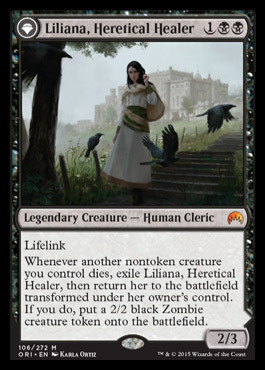 Liliana was destined for great things, like showing up as a one of in Modern Collected Company decks or greedy Rally the Ancestors decks in Standard. I’m still not impressed with Liliana, especially for how much hype she was getting before this weekend. The fact that this card is within $2 of Nissa, a card that fared much better, still baffles my mind. I’m either greatly underestimating the casual appeal of these cards or there’s a lot of people that are going to feel bad about their $25 copies of Liliana going forward. Jace was one of two walkers to show up in force this weekend. 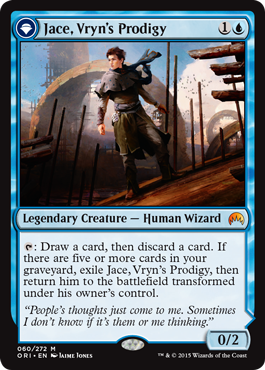 As it turns out, Merfolk Looter is really good alongside Jeskai Ascendancy…landing this Jace in the top 8 with a 6th place finish. Some non-ascendancy Jeskai decks also featured Jace and round out the top decks with 17th, 30th, 31st, and a 34th place finish. Combining the looter effect with delve spells is proving to be a very powerful combination, especially when Super Sayain Jace starts flashing back Treasure Cruise or Dig Through Time. While his inclusion in these decks is impressive… being limited to one archetype is generally not enough to maintain a $20 price tag. As supply continues to enter the market, expect Jace to start winding down to a more maintainable $10 price point. If there was a clear winner based on overall inclusion, it’s gotta be Nissa. Apparently Borderland Ranger is an effect that’s welcomed in the plethora of Abzan decks (and few G/R) that Nissa made an appearance in. The ability to ensure that a turn four Languish or Siege Rhino resolves appears to be more than enough to trump the forest-only limitation. In total, Nissa appeared in twenty of the top 64 decks at this weekend’s open, just under 1/3rd…a fairly impressive number. This is the point in the article that I admit to totally misjudging this card. Nissa’s presence in so many decks is a clear sign that this card has struck a chord with the player base and is going to continue showing up in the top decks, especially as long as so many powerful green cards exist in the format. If Nissa posts a strong finish at the Pro Tour, I wouldn’t be surprised to see this spike up to the $35 range as players scramble to acquire copies while supply is still relatively low. Six months from now I expect Nissa to be somewhere between $15-$20, so I wouldn’t hold onto this card past a spike if you don’t plan on using it. The quiet breakout hit of the SCG Open is not a new card, but a forgotten friend returned to us. Gaea’s Revenge ruined a number of games for Jace players back in the day, dodging countermagic and spot removal gave this card a huge advantage against the blue decks that only had one real answer: Day of Judgment, and many times it was already too late as Gaea’s Revenge has that whole hasty giant fatty thing going for it. Currently listed under $1 a piece, there has to be significant upside to this card… keep in mind that the first time it was printed it was at Mythic, so the existing supply is not even that extensive. Gaea’s Revenge will be exceptionally powerful going forward as it’s going to require a Crux of Fate or an End Hostilities for control decks to take it out…Languish just isn’t going to cut it. Day’s Undoing did make a couple of appearances at the SCG Open this weekend. One in the latest iteration of everyone’s least favorite deck: Turbo-Fog and another couple of Legacy decks: Affinity and Omni-Tell, both of which managed to crack the top 8. We were already warned about some of the sicko affinity hands that could dump and reload thanks to this card, but as it turns out: that strategy actually worked. It also turns out that this card was powerful in the Omni-tell, a great way to rebuy those Show and Tells and cantrips, or just refill after sticking an Omniscience. The Turbo-Fog deck took advantage of the “free refills” this card provided despite the counter-intuitive interaction with it’s main win condition: Sphinx’s Tutelage. Reloading with a fist full of Fog effects wasn’t enough to crack the top 64, I imagine due to the reality that Fog doesn’t work very well against a fist full of burn spells. Day’s Undoing is clearly a powerful effect, but how pervasive will that effect be? That remains to be seen. This price on this card has already mellowed from that $20 preorder to a more reasonable $15, but I imagine that number will continue to shrink as more and more Standard players finding themselves asking, “What the hell am I going to do with this?” I’m on the same train as a number of other writers with this one: I’m not excited at $10, but if it hits $5 you can bet that I’m a buyer. The format is far from solidified. We’ve come a long way from the days when a new brew was sure to tear up the first big tournament. Much of today’s innovation comes from MTGO and those results transfer to paper on a slight delay, which is unfortunate because Magic Origins isn’t even out on MTGO yet. While we have an initial sampling, it’s clearly not time to panic sell yet. 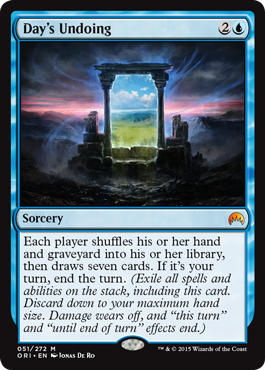 There should still be a fairly substantial shift in the metagame coming as players are able to acquire and try out more of these cards over the next couple of weeks, culminating in a grand hurrah at Pro Tour Magic Origins in less than two weeks. I’ve got a busy few weeks ahead of me, I’ll be attending GP Dallas this weekend working with those Aether Games folk followed by a four day stint at GenCon in my home town of Indianapolis at the MythicMTG booth and finally at GP San Diego with Aether Games. Like always, I hope to see you guys there and make sure to introduce yourselves when you come up to the booth. Remember when Frontier Siege was all the rage?? And Mastery of the Unseen was the Soup du jour? I know you and everybody has to talk about something but I think everyone needs to chill out a little bit about how much or how little an effect certain cards and decks had. Your Pro Tip is 100% correct. Only time there’s major innovation usually is around rotation. First, I’m not sure why people say this is the best core set. I haven’t been around for many and I haven’t played in all the limited environments due to schooling, but people act like this is the best core set for Standard. I’m not sure what I’m missing, I’m glad people are pumped, but they hype has to settle down. Elves likely won’t take over Standard, not with all the different mass removal spells, but it’s nice that people can dream like with Slivers. Also, attended a draft tonight and we were all extremely underwhelmed while drafting (it was a 10 man pod so that might have contributed). I went 3-0 with a boring UB deck, so I guess I drafted correctly and had a little luck with matches but none of us really enjoyed the experience. Second, l think the Pro Tour will highlight hard control (not Esper Dragon type control with lots of creatures) and will shift the meta. Green usually can’t deal with mass removal and if control can deal with Whisperwood and play smart enough to not die to Gaea’s Revenge then it seems heavily favored. I look forward to the match up. I’m thinking Pearl Lake might make a return to the top deck lists. I love the Celestial Flare reprinting. 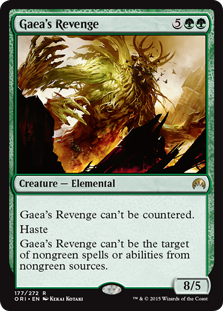 Oh and Abzan Charm exiles Gaea’s Revenge (although that’s not the matchup it’s intended for). Third, a friend ran a red-burn type deck and crushed us all in testing…then he faced Abzan at an IQ and got slaughtered by Coursers, Rhinos, and recurring creatures and spells from Den Protector. Chandra was great in testing, so was Scab-Clan Berserker, but vs. Abzan and Polukranos and Green Devotion it just couldn’t cut it. Lastly a few quick points: This isn’t the Standard for Bellower, not with the much better Gen Hydra and Nykthos around. I know you hate the new Liliana, but she has the highest foil pricing of all walkers still. I don’t know if it’s casual appeal, the fact that Liliana of the Veil is $100+, or as I keep saying it fits in Modern CoCo beautifully, but she’s going to break out in one format. Might even just be Tiny Leaders. 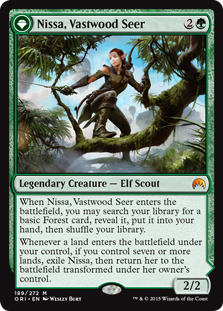 Nissa is a fine card and as I (and a lot of people said) she will be played frequently in decks just to hit land…until people develop decks that are just too fast and she becomes a liability. Unfortunately as you said her high inclusions will make her crazy expensive…quite unfortunate but that’s life. Erebos Titan is a better Shorecrasher Elemental but it’s still just an overhyped devotion enabler. Mono black devotion (/control) was amazing because you could turn your turn 10 draw of Thoughtseize into a Pack Rat, or use it to protect your rat. New mono black is just a bad version of Abzan and devotion is on the way out so just sell all your Titans now. People should play Abzan Whip if they want to have fun with Grey Merchant one last time…but he still should be cut. And tons of people at this IQ were pumped about the turbo fog deck…Days Undoing can’t be the right card for that deck though unless the player needs to get their fogs back out of the graveyard. All told the weekend in Chicago seemed to lack a lot of interaction and removal. (How did Languish fair btw because it’s jumped to $10 even with the full art Game Day promo on the horizon?) I didn’t see Draconic Roars burning Jaces and players and that seems like simple deck building. If people were afraid of Languish I’d expect some type of Temur Dragons build with Stubborn Denial and/or Temur charm to step up. I’ve told my friends to play Temur as nobody seems to know how to play around Counterspells and you still get to jam a lot of the best creatures or Planeswalkers. Mostly I think you were right, this “amazing Core set” didn’t seem to change much in Standard (yet). Good luck on your long road ahead homie. Hey Spencer, thanks as always for reading and commenting on my article, I’m traveling for events this week so I don’t have a whole lot of time to respond to all the points you made BUT… Woodland Bellower will have his day and you can blame Travis for not doing a good job editing my article!